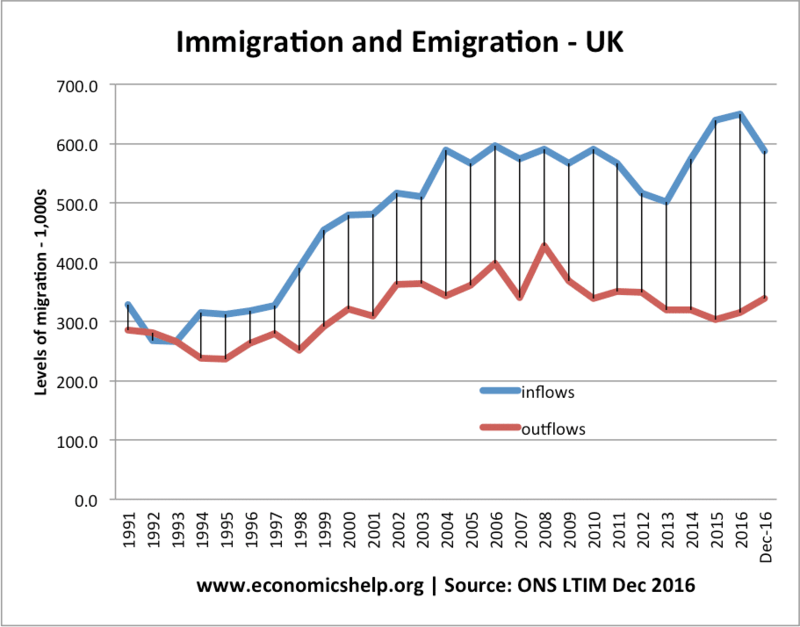 In the past two decades, the UK has experienced a steady flow of net migrants into the economy. This net migration has had a wide-ranging impact on UK population, wages, productivity, economic growth and tax revenue. 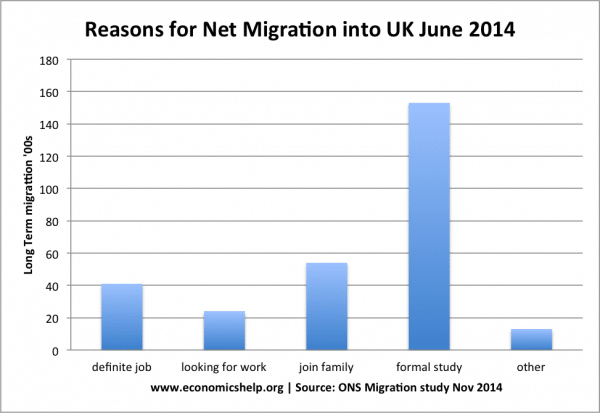 To what extent does net migration benefit the UK economy? In 2016, Net long-term international migration was estimated to be +248,000 in 2016. Immigration was estimated to be 588,000 and emigration 339,000. In the past five years, the UK population has been boosted by net migration of around 1,000,000. In 2011, the top 3 countries for the source of migrants was India, China and Pakistan. The top 3 destinations for people emigrating from the UK was Australia, India and US. This shows that immigrant workers are likely to be in the mid-20s and 30s. It is this age group where workers are most flexible and willing to travel to find work. As they near retirement age, immigrant workers are more likely to return to the country of their origin. This age composition has implications for net contribution to tax revenues. Migrants are more likely to be of working age. The majority of migrants come for work or study (students) They may bring dependents, but generally net immigration leads to an increase in the labour force, a decline in the dependency ratio and increases the potential output capacity of the economy. Net inflows of people also lead to an increase in aggregate demand. Migrants will increase the total spending within the economy. As well as increasing the supply of labour, there will be an increase in the demand for labour – relating to the increased spending within the economy. Ceteris paribus, net migration should lead to an increase in real GDP. The impact on real GDP per capita is less certain. In fact, net migration can make economic growth look stronger than it is. 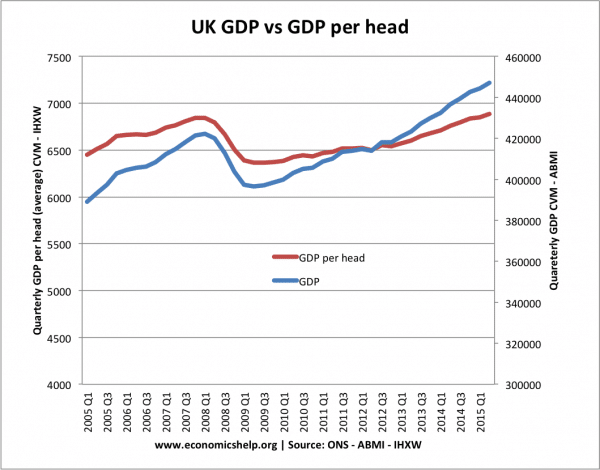 In the period 2005-2015, UK real GDP has increased significantly faster than GDP per head. See: GDP per capita for more info. Net migration could create a more flexible labour market. Migrants will be particularly attracted to move to the UK if they feel that there are job vacancies in particular areas. For example, during the mid-2000s, there was a large inflow of workers from Poland and other Eastern European economies – helping to meet the demand for semi-skilled jobs, such as builders and plumbers. The government has also sought to attract migrants from various countries to meet shortfalls in job vacancies in key public sector jobs, such as nursing. With an ageing population, the UK is forecast to see an increase in the dependency ratio. However, net migration helps to reduce the dependency ratio. Migrants are a source of working age people, and this helps to reduce the ratio of retired to working people. This has benefits for the government’s budget. If migrants are of working age, they will pay income tax, VAT – but will not be claiming benefits. An important reason for net migration is higher education. In 2010/11 there were 428,225 international students (link), studying in the UK. These students may not show up in long-term migration trends. But, the short term effects are quite important. The Russell Group of leading universities suggests foreign students contribute £2.5bn a year in fees (link) – helping to finance higher education for domestic students. Another issue felt keenly in the UK, is the concept that we are already ‘overcrowded’ In this case, a rapid increase in the population due to migration could lead to falling living standards. For example, the UK faces an acute housing shortage, but also an unwillingness to build on increasingly scarce green belt land. In many cities, it is difficult to build more roads because of limited space. The increased population could increase congestion and urban pollution. Therefore, the increase in real GDP has to be measured against these issues which affect the quality of life. Others may argue that concepts of ‘overcrowding’ are misplaced. In the nineteenth century, people were already worried about overcrowding. But higher population densities are in one sense more efficient and have a lower environmental impact. Other countries like Belgium have an even greater population density than the UK. Also, if migrants help to grow the economy, there will be more tax revenue to finance public infrastructure. “EEA immigrants have made a positive fiscal contribution, even during periods when the UK was running budget deficits. Immigrants who arrived after 1999 were 45% less likely to receive state benefits or tax credits than UK natives in the period 2000-2011, according to the report by Prof Christian Dustmann and Dr Tommaso Frattini from UCL’s Centre for Research and Analysis of Migration. However, despite the positive figures in the decade since the millennium, the study found that between 1995 and 2011, immigrants from non-EEA countries claimed more in benefits than they paid in taxes, mainly because they tended to have more children than native Britons. The UCL report on immigration suggested that immigrants tend to be more highly skilled than native workers. In 2011, 32% of recent EEA immigrants and 43% of non-EEA immigrants had university degrees, compared with 21% of the British adult population. No clear link between migration and unemployment. Net migration occurred with falling unemployment 1991-2005. But, rising unemployment from 2008-12. The fall in unemployment since 2012 may have attracted more migrants coming to work. 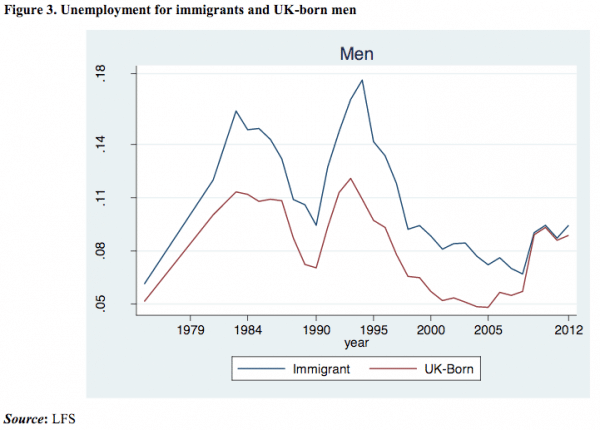 A common question people often ask – is whether immigration causes unemployment? Migrants have often been blamed for ‘taking our jobs’ – especially in periods of high unemployment, and in local areas of above average unemployment. Firstly, net migration is compatible with low unemployment. Net migration helped the US population to increase drastically around the turn of the century, but this didn’t cause unemployment. Migrants bring both increased supply of labour and higher demand for labour. 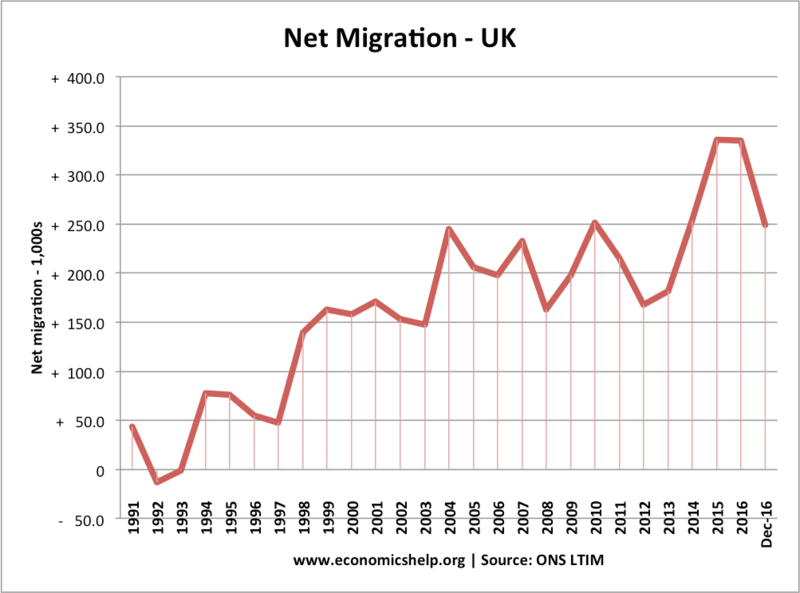 In the 1990s, net migration was consistent with falling unemployment in the UK. However, in periods of high unemployment, it may be much more difficult for migrants to find work. This may be exacerbated if the migrants have poor English, low skills and or suffer racial discrimination. In this case, net migration could add to the unemployment problem. 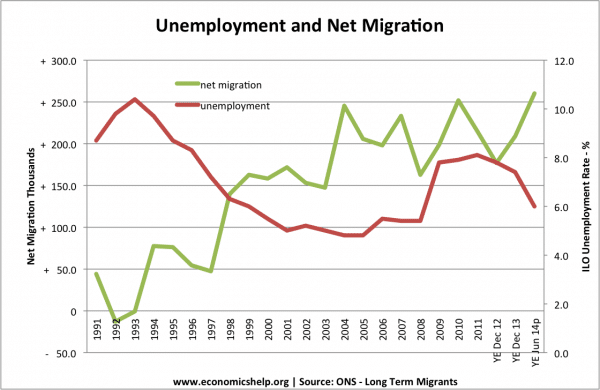 However, the underlying cause of unemployment is not the net migration, but the recession. Another factor that determines the impact on unemployment is the skills and qualifications of immigrants. If migrants have low skills, they are more likely to experience structural unemployment. In the 1950s, immigration into the UK from the Carribean was encouraged for manual labour (driving buses e.t.c.) to fill job vacancies. However, when the period of full employment ends, migrants may be more liable to be unemployed, if they lack the skills to find new work. The impact on unemployment in the current crisis depends on the type and skills of workers who are migrating into the UK. 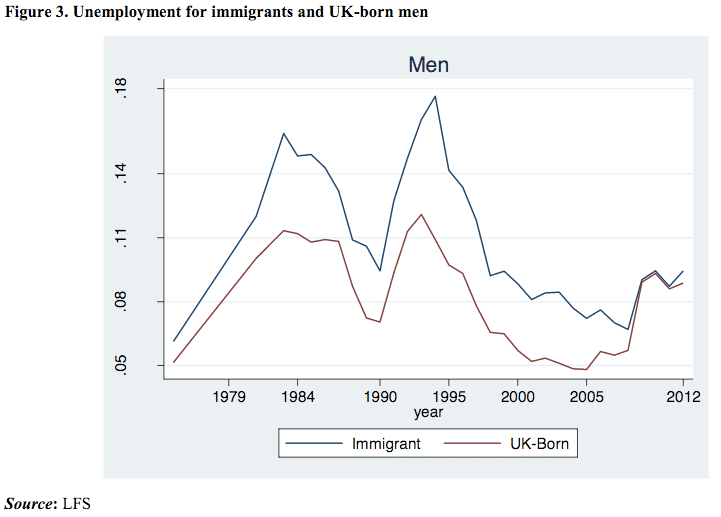 This shows that the unemployment rate for immigrants tends to be higher than for UK born workers. This gap is especially true during recessions. One reason put forward is that immigrants tend to be more likely to be working on short-term contracts, and so in a downturn are more likely to be laid off. Does Immigration Push Down Wages? From one perspective an increase in the labour supply may push down wages. This is especially true if migrants are keen to accept lower wages (e.g. willing to bypass traditional union bargaining). However, again, net migration doesn’t have to push down wages. The massive immigration into the US, during the twentieth century, was consistent with rising real wages. 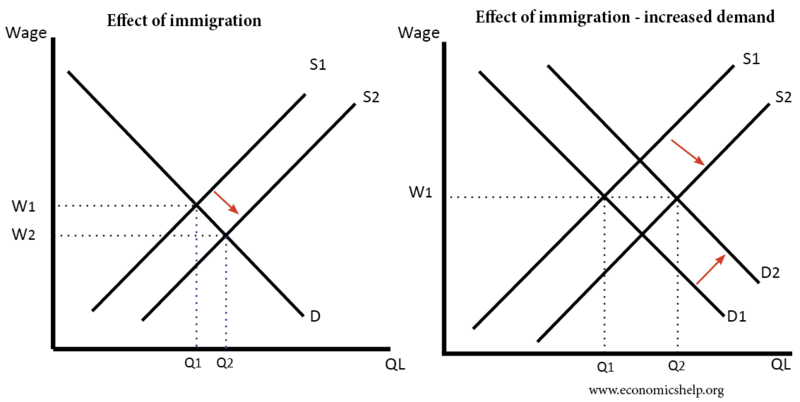 Increased migration, will also affect demand for labour due to higher spending in the economy. Immigration increases labour supply – but also increased labour demand. However, particular labour markets may notice lower wages if there is a concentration of immigrants willing to work. For example, if wages are high in a particular agricultural market, migration from a low-income country may lead to falling wages in these specific markets. Also, some migrants may be more vulnerable and more willing to work in the black market (e.g. accept a wage below the equilibrium). Further reading: Lump of labour fallacy – the fallacy increased labour supply always pushes down wages. A Bank of England found a rise in immigration had a tiny impact on overall wages – with a 10% increase in immigration – wages fall by 0.31%. However, the negative effect was greater for semi/unskilled workers in the service sector, with a 10% rise in immigration reducing wages the equivalent of 2%. B of E report. However, this explains only a small fraction of the real wage decline since 2007. What explains fall in real wages since 2007/08? The skills and qualifications of migrants. The UK is increasingly strict on allowing only skilled workers. How easy do migrant find it to assimilate in the destined country? E.g. in the 1950s and 1960s, migrants from the Indian sub-continent / Carribean may have found it more difficult to find employment due to poor English / racial discrimination. It depends on the age profile of migrants. If a high % are young workers, then this can help reduce the dependency ratio – a crucial issue for the government budget. It depends on the current economic climate. In a recession, migrants will find it harder to gain employment. It depends on the type and skills of migrants. Migrants from Eastern Europe may be more flexible and return home if the economic situation deteriorates. Low skilled migrants are more likely to be structurally unemployed. Migrants can be a source of foreign income, e.g. tuition fees from foreign students. However, migrants may also send a substantial portion of their earnings to relatives abroad – reducing the wealth of UK. Can the Economy absorb a greater population? For example, what are the impact on public services, levels of congestion, and housing? Positive net migration levels are a significant factor in increasing the number of households in the UK. Given limited housing supply (and difficulties of increasing supply), this is putting upward pressure on UK house prices and the price of renting. NOTE: EEA – European economic Area – EU, plus EFTA countries Norway, Iceland and Liechtenstein. This entry was posted in economics and tagged immigration, unemployment. Bookmark the permalink. This site is appears to be less about objective economics and more about pushing pro-EU propaganda. For example, it quotes studies produced by UCL’s immigration research department (CReAM). However, the author of this article appears to be unaware of the fact that CReAM’s studies have been discredited by a number of eminent statisticians (including UCL‘s own Emeritus Professor of Statistics). The criticisms are extremely serious. Professor Mervyn Stone and others refer to the use of underlying crude assumptions, an all-embracing approach, the absence of sensitivity tests and the study being driven by a desire to prove a pre-determined conclusion. The CReAM studies also totally ignore a number of costs arising from large-scale immigration. For example, they takes NO account of costs such as welfare benefits or social housing provided to displaced British workers. These costs run into billions and would almost certainly wipe out the modest gains asserted by Dustmann and Frattini. There are other problems with this article. 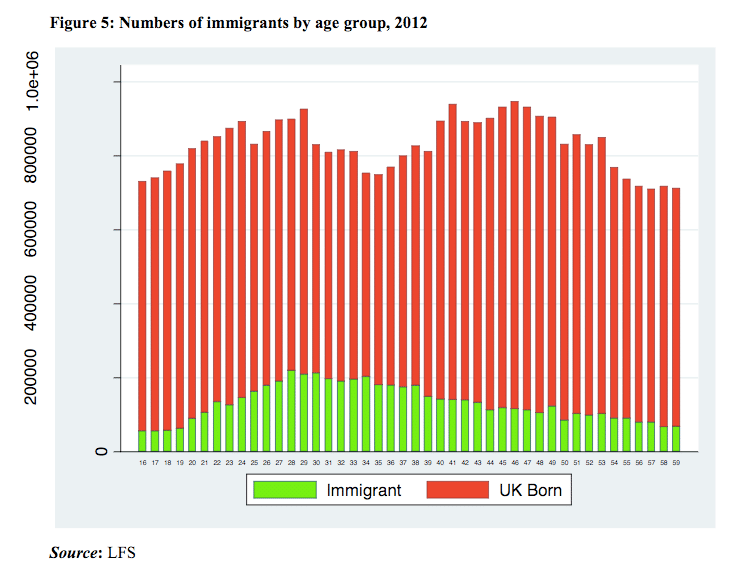 For example, using US migration flows in the early and middle 20th century as a comparator to 21st century Britain! But as this comment probably won’t even appear, I won’t waste time going over all the other issues. Terry, you claim that “The British cannot afford to buy in London, not even rent, it is too expensive. How come Muslims can take up residence in the Capital, where does their wealth come from, British social security payments?” Actually, lots of British people can afford to buy in London, and lots of Muslims (British or otherwise) can’t. Also I very much doubt that many people, British or otherwise, get rich from social security benefits. Where on earth did you get your statistics from? Terry has no statistics or studies to support his assertions. He is regurgitating the Daily Mail and Express, who made it all up for people like Terry. I don’t think Terry has ever been to London. If he had he’d know that, overwhelmingly, the people of London are not wealthy. He’d know they struggle to pay their mortgages, food bills, energy bills, local taxes, local parking, travel costs… like everyone else. Terry would also know, if he’d ever been to London, that it’s the most cosmopolitan city in the world. The wealthiest people in London, apart from those who work in the City, and a few oil-rich Arabs in Knightsbridge, are Russian and Chinese businessmen who tend not to be Muslim. Terry should also know that less than 5% of the UK population is Muslim, and that about 40% of the UK’s Muslims live in London – mostly in the poorest boroughs like Newham and Tower Hamlets. But Terry doesn’t know any of this because the Terry’s of this world have their information and preferred narratives fabricated and assembled by the UK’s populist press, to suit the agenda of the non-dom, billionaire, tax-avoiding UK populist press owners. Looking at longer GDP stats for the UK, there is no evidence that immigration has boosted or accelerated the growth of our economy. It appears that it simply proves that, on average, to succeed in work it doesnt matter where you come from or how skilled you are as most jobs don’t need a particularly high skill level. If immigration was needed, we should see an acceleration in our GDP and a deceleration in the GDP of countries who’ve provided immigrants. There is no such effect. If supposedly highly skilled immigrants all left and were replaced by supposedly lazy Brits, I doubt we would spot any change, as the reverse process made no difference. Louis Walker is rather harsh about this website, which I think is distinguished for its clarity, but is factually correct in noting the statistical criticisms by their professorial colleagues of the Dustmann/Frattini report (Immigrant Fiscal Contributions 2001-2011), particularly Mervyn Stone to which I would add the work of Robert Rowthorn (Emeritus Economics Professor at Cambridge) in his 2014 report. However the continued general acceptance of the fiscal contribution of immigration, notwithstanding that even Dustmann quantifies the cost of earlier non-EU immigration at £90 billion from 1995-2011, fails to address the the issue of the public expenditure shortfalls right across those areas where immigration should have required such expenditure to increase. The perverse effect of this shortfall is to increase the apparent fiscal contribution of immigrants, and indeed all inhabitants, by the simple expedient of not actually spending the contribution on those areas which need it. Nowhere is this economic illiteracy more obvious than housing. The much quoted requirement to build 240,000 houses per annum is largely based on the forecast of household formation from the Department of Communities and Local Government with a 2012 base year and a principal population projection based on net immigration of 165,000 annually to 2031. At that level the DoCLG concludes that about 40% of household formation is due to immigration but, adjusted for their larger households, means that about 83,000 new houses annually are required solely to keep up with immigration. At £250,000 per unit that is over £20 billion annually that has to found to stand still. (Dustmann’s EU immigrant challenged contribution ran at just £2 billion annually) Last year net immigration was 300,000, 80% greater than the DoCLG projections. The cost of properly housing all in our nation is rising exponentially and is becoming impossible to resolve by any remotely conventional policies. We must all draw our own conclusions as to why uncritical support of immigration by the owners of capital, exemplified by the CBI, continues to be the default position of broadcasters and most of the press who seemed to have suppressed the old journalistic maxim of ‘follow the money’. To find who is making money out of immigration is where to start questioning current received opinions as to who actually benefits. Migration Advisory Committee July 2014 report on unskilled migration which drew the conclusion that the principal gainers were the migrants and the owners of capital. We must all draw our own conclusions as to why the uncritical support of immigration by the owners of capital in the UK, exemplified by the CBI, continues to be the default position of broadcasting and most newspapers. Informative and fairly unbiased. Louis most of the data was from ONS it seemed? It could be argued your comment is purely from an anti-EU standpoint. Thanks for the information, especially highlighting the fact that so much migration into the UK is to do with study, which brings millions of pounds into the economy. I am interested to know if there is any way to calculate how much money has come into the UK due to rich migrants fleeing war zones in the Middle East. My local neighbourhood has seen a noticeable influx of rich Iraqis and later rich Syrians over the last 15 years so I often wonder how much the UK profits from these wars. Also, I recently read an article about how instability in Turkey was leading rich Turks to invest in more property in London, and in many cases they were thinking of sending their children to university in London. I think the UK is seen as a safe bet in times of global instability. Stone and Rowthorn are outliers in terms of researchers, their views are not definitive. A fiscal spend that does not take place is not then a fiscal spend? The £20bn you estimate is not provided free to immigrants, they pay for their accommodation and so it does not ‘have to be found’. If you were correct then Sir Nickells’ conclusion would not stand, but most do economists accept that the surprising thing about immigration seems to be how little it affects unemployment or the per capita income of incumbents. For example, as with David Card’s research and that of NIESR. A major benefit ignored here is the OBR’s estimate of significant government debt ratio reduction to 2060 as total GDP grows even if per capita stays broadly the same. Query on Ross: If GDP per capita remains constant, what is the point of any immigration? If doesn’t benefit the incumbents, and the incumbents are so strongly opposed to it, why have any at all since it only allows benefits the elite? I thought income inequality was thought to be a serious problem, if not THE problem? Any estimate on debt ratio reduction to 2060 would seem likely to be purely speculative, and based on the ONS projection of a UK population of over 100 million by 2114. It’s hard to imagine what that would look like – hardly a “green and pleasant” land – with the majority of any benefits that accrue disappearing offshore. Roger: Immigration greatly benefits immigrants at no cost to incumbents- surly that matters? But I accept that immigration is a social issue even if it is not an economic one. Great article, I’ve been thinking about this subject all day today, especially that the new EU referendum has just been announced for 23rd of June. I’m an immigrant from Eastern Europe, and I’m proud that I came to the UK and serve this nation with my skills and talent. However, whoever says that immigrants are damaging the economy or that are pulling down wages, I must say they are fairly stupid (sorry). I’m a highly skilled automotive paint sprayer, and I earn just over 40K a year (yes, that’s £20/hour). Now £40K for a paint sprayer is a colossal sum, even for a native worker, the average paint sprayer earns around £25K-£28K a year. So I’m obviously not pulling down wages, but the opposite: I’m motivating other people to work harder and earn more. The matter of fact here is that I, just like hundreds of thousands of other highly skilled immigrants, am not providing value to the nation by offering cheap labour, but instead, by offering talent, ambition, motivation, unique skills and extremely fast work. Something that hundreds of companies wouldn’t get, if it wasn’t for us. And we also spend a lot of money and pour it back into the economy to “make the engine turn” – me and my wife are injecting more than £2.7K every month back into the system (well, we are humans as well we go to the pub, we go to restaurants, we eat fish and chips, we drive our car, we pay our rent and bills, etc. ), plus we pay hundreds of pounds of taxes, and we never ever claimed benefits. Just look at the US: it accepted millions of immigrants that literally built the country from scratch, and they are still accepting immigrants that are driving innovation and creating companies over companies, and using their talent to boost the economy and the country is booming with companies that can compete on a global scale because they have access to great talent and great people. I agree with your comment, I’m a native but understand and agree that many skilled hard working people bring innovation and creative progression as a nation. Unfortunately there is a balance on both ends of hard working. One may work hard to gain at others expense then you have hard workers who work hard for a better future for everyone. I agree with you , one part of immigrants help boost UK’s economy,they are hard working and pay tax,but there are other part of immigrants who came to UK to claim benefits. Overall, looking at GDP growth for last 50 years, immigration demonstrably has no effect on economic growth. I am interested in having a copy of Professor Christian Dustman’s report supporting his assertion that majority of immigrants claim more benefit than paying taxes. Productivity in the UK has barely grown since the late 90s because of underinvestment in industry. Capital has been routed to infrastructure to support a larger population: roads, hospitals, schools in particular. Historical investments in infrastructure, both public and private, after allowing for depreciation/obsolescence represent over £1million/head. Only looking at income, benefits, and tax contributions misses the balance sheet impact of too fast growth. What I find more interesting is that the Remain Campaign seemed to provide solid statistical analysis as to how immigration improves the UK economy where the Leave campaign have barraged comments about without any backup, clearly targeting those who either do not wish to view the facts or do not have the basic skills to understand them. This is not the only website which has positive analysis for immigration and we are not the only country to prove the benefits of it. The Leave immigration agenda was a clear scapegoating mechanism designed to do one thing – get the uneducated and xenophobes to vote leave. Farage has been using this as the basis of his campaign since the beginning of his leadership within UKIP. Nice report. It will be interesting to see how attractive the labor market remains and impacts the longer term migration trends once the dust settles from brexit. Migration for education will likely remain strong, but the trend for where these graduates will move for work is more open for change. Of course, collecting such detailed statistics would not be quick, cheap, nor easy.